Broadcasting news/category/enflash continuously via a dynamic display device in your waiting room, in a commercial establishment, in a hotel reception... is a definite plus. To do this on your Raspberry Pi, you need a flexible and powerful digital signage on Raspberry Pi that can adapt to your business. In order to be a plus for your business, your broadcasts must be attractive, clear and well paced. A digital signage software should allow you to manage slideshows, transitions, display very readable tables and update the information to be broadcasted. Linutop.tv, a server program designed for Raspberry Pi, is an ideal solution. Easy to configure and lightweight, it can distribute your playlists and your digital content as you wish on players. Just set it up according to your needs, it will then broadcast your playlist in loop. Its menu also allows the integration of browsers settings, so it is easy to transmit streaming video feeds via the digital display. 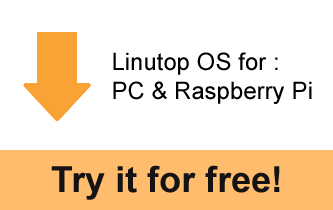 Linutop OS, can be run on Raspberry Pi as its operating system. It includes the digital signage software Linutop Kiosk. The latter is especially designed for digital signage and allowing secure access to the internet. It is ideal for use in hotels, museums, shops, government offices, schools.